With new iOS versions (iOS 11, iOS 12, and later), the new Control Center toggles for turning off Wi-Fi and Bluetooth do not actually turn off Bluetooth and Wi-Fi on an iPhone or iPad. Instead, if you hit the buttons for disabling Wi-Fi or Bluetooth in Control Center, the iPhone or iPad will disconnect from wi-fi or Bluetooth, but not actually turn off those wireless services on the iPhone or iPad. 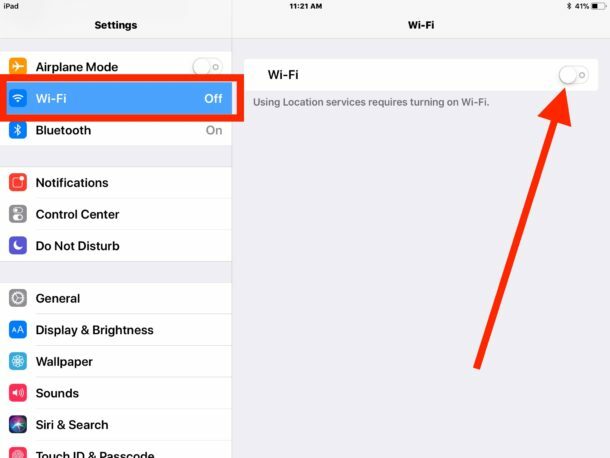 This can cause some confusion for obvious reasons, and many users are left wondering why wi-fi or Bluetooth is not actually turned off on their devices, or how to turn off wi-fi or Bluetooth in iOS 11 and newer completely. 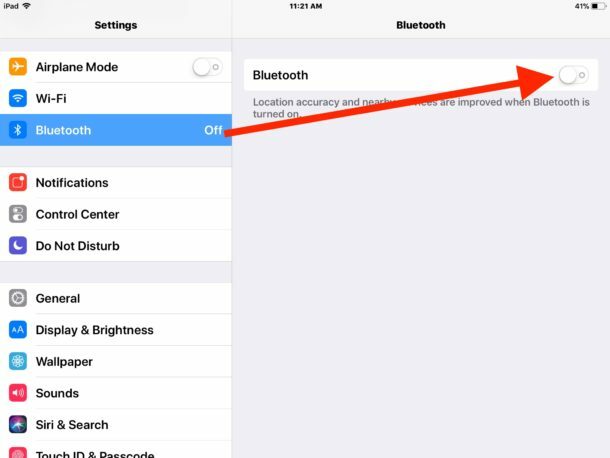 You can still turn off wi-fi and disable Bluetooth on an iPhone or iPad with iOS 11 and newer, but rather than use Control Center to turn the wireless features off, you must go to the Settings app to disable either. To be clear, turning “off” Bluetooth or Wi-Fi in Control Center simply disconnects the iPhone or iPad from wi-fi or Bluetooth. For example, if you hit the wi-fi off button in Control Center, it actually just disconnects from the current wi-fi router, but the wi-fi service remains active on the device. Similarly, if you hit the Bluetooth “off” button in Control Center, it only disconnects any connected Bluetooth device (like a keyboard or Apple Watch), and does not actually turn off the Bluetooth service on the iPhone or iPad. This is different from how Control Center worked in past versions of iOS, where hitting the toggle buttons would actually disable the service rather than simply disconnect from connected devices. 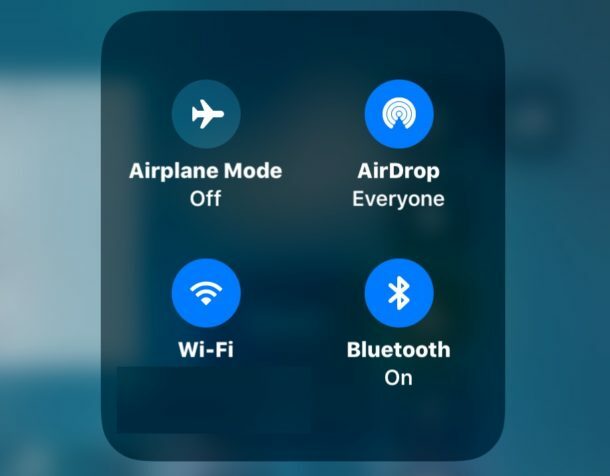 Note that the AirPlay mode option in Control Center continues to work to disable both Bluetooth and Wi-Fi, but AirPlay mode also turns off the cellular capabilities of the device, thereby taking it completely offline. Remember, the wi-fi and Bluetooth toggles in Control Center for iOS 11 and iOS 12 disconnects only, it does not turn off wi-fi or Bluetooth. To actually turn off wi-fi or Bluetooth now, you must go to the Settings app instead. The wi-fi settings section still allows you to forget wi-fi networks and perform other similar more advanced options as well. In some ways this change is a feature improvement because now there is an easy way to disconnect from wi-fi or Bluetooth without disabling those services, this can make it slightly easier to join a hidden wi-fi network from an iOS device for example, particularly if your device is auto-joining another network, but the change in Control Center button behavior can lead to some confusion if the new behavior is not understood. This isn’t the only change brought to the totally redesigned Control Center of iOS 11 and later, and there are some other feature adjustments that take some getting used to as well, like accessing the Night Shift toggle in Control Center of iOS 11. Fortunately much of Control Center in iOS is now customizable via the Settings app too, so it’s possible that future versions of the operating system will unveil new button toggles to have these functions more directly. Remove Bluetooth PAN Helps Resolve Wi-Fi Conflict in OS X Yosemite? It’s obvious that some of the modifications are made just for the sake of changing something and not out of necessity, because the engineers are under pressure to release a new operating system every year and they must have a hard time finding what to tweak. And the wifi and bluetooth switches in iOS 11 seem to be a good example of this; they were working very well in all previous ios versions, so there was no absolute need to change their functionality. Another good example is what they did with the night shift switch, also in control center; there was no absolute need to hide it behind the brightness bar. Apple engineers never apply the rule of thumb that if anything is working well it should not be changed. And for those of you who say “everything kills you” or “we all get cancer”, good luck. I’d rather lower my risk. It has actually been proven in court that Glioblastoma Multiforme cancer is linked to cell phones. That is an option for us to save in a new format. With the 4k recording is getting popular, and we have 256GB only on the phone, are you sure H264 is still good for these days? Move on people, if you worry that you can’t handle it, just stick with the old format. Look at all the messenger app, when you send a video, it compress into a horrible quality to make it into a small size, is this what you want? You’re writing _AirPlay mode_ but it should say _Airplane Mode_. This makes absolutely no sense. The whole point of those shortcuts is to do just as they are intended, turning those functions off. Hopefully they put them back to how they function in previous versions. Just be quiet. Apple knows what you really need, and what you mistakenly THINK you want is irrelevant. Just go along. You will be assimilated. Bravo! Welcome to our Brave New World. @Louie – Just because they have the label “Engineer” in their title does not mean that “they” are competent or have any common sense. Nor does it mean that any number of hair brained ideas aren’t coming from Marketing and/or Sr. Corporate Management. It wasn’t too long ago when Apple was on the verge of imploding from the expense of a LOT of bad ideas and misdirected management decisions. Having said that, Apple obviously still has a lot of capable talent. Let’s hope that they actually listen to our complaints and feedback, and adjust accordingly. Thats because you do not use the offered way, “Reply”. What is all that @ing anyway? Apple has no incentive to make sense any more. They are making more money by selling components to Samsung than by making their own iOS work properly. This change should have been accompanied by a much clearer warning. Maybe a popup that tells you the radio is still on, but the connections are disconnected. There are real life important reasons for this. If you wear an under skin heart monitor you are not allowed to have Bluetooth working on any device on your person. When I first downloaded ios11 I almost lost my drone over the water because Bluetooth was causing major interference with the signal, and I had no idea what was going on. Gee, as MJ on South Park would say, ‘You are ignorant’. This is a super obvious push for Airdrop/Continuity. You know, there are still people turning Bluetooth off cause they believe it’s still 2005 and Bluetooth will drain their battery (even on their Macbook Pro’s!). There are people turning off WiFi cause their 4G/LTE connection is faster. Now Airdrop (and Continuity) will continue working! Seriously, Airdrop is so fast, using it should be a no-brainer. But still, people don’t really know it and send 4-5 MB photos to each other via iMessage. This summer I got sick of asking people to turn on their Bluetooth to airdrop them a couple of photos, only to hear them say afterwards “Oh was that it? Fast! Cool!” – and then they turned bluetooth off again (facepalm). If there is some life-critical condition, just turn radios off through the settings. Simple. For the rest of us, thanks Apple! U sound such a fanboy. Is it too complicated to understand that IF i want to turn OFF wifi or bt on MY phone i dont need to give any excuse??? If they have a shortcut for turning off these services it’s just stupid that at the end the shortcut doesen’t accomplish the simple task. If one loves to have everything on doesen’t need any shortcut…. This is so dumb, I’m at loss for words. Why would you downgrade the control center with such a stupid LACK of a feature. It worked perfectly well but they had to “fix it”. Can’t wait to get a Google Pixel. It seems “disable” and “turn off” are not the same anymore according to Apple. iOS 11 still has battery problems so turn it off is the best option now, I use Siri to do this task which is faster than navigate thru settings. You do realize that Apple’s anonymous WiFI handshakes have been cracked and that stores and outfits like google are using wifi on users phones to track them out in public? Turning WiFi off defeats this intrusive practice. Disconnecting and calling it “Off” is akin to User Interface “Fake News” and I’m seeing more of it come out of Apple. And as I touched on the subject privacy, I question why Apple’s marketing likes to push “Privacy” when they sell google the right to be the main search engine for $3 billion a year. That smacks of taking blood money from the bottom feeders. Do you have a source for that? I replied earlier, but perhaps there’s a blocker on links in comments. “In June 2016, midway through our research, iOS 10 was released. Inexplicably the addition of an Apple vendor specific IE was added to all transmitted probe requests. This made identification of iOS 10 Apple devices trivial regardless of the use of MAC address randomization. We believe the difficulty of identifying MAC address randomization to be one of the best countermeasures to defeating randomization. Compounding our incredulity, the data field associated with this IE never changes across devices. To be fair, this paper says that Apple devices are eventually harder to follow… On the other hand, Samsung does not perform any MAC Address Randomization! For the record, when you press the WiFi toggle, it clearly says ‘Disconnected from MyWiFiName’ – it does not say WiFi inactive or something – if you care about semantics. I think my argument about Airdrop/Continuity (see comment above) makes more sense than Apple joining a global network of MAC address derandomizing scheme to track our every move hand-in-hand with Google. It would just be easier to hand them out Find My iPhone data, I guess. In June 2016, midway through our research, iOS 10 was released. Using our combined set of all Apple iOS signatures, we identify ∼1.3 million distinct randomized MAC addresses, by far the most populous (94.7%) of our randomization categories. I beleive this was the paper (first link in this Hacker News thread) that mentioned these ease of figuring out the “randomization” of handshakes from an iOS device. The paper is several months old. Apple *may* have fixed it by now. Who knows. You can also run a search on ycombinator dot com for similar threads. I have a feeling that Apple can’t do much more at a software level, they’re still susceptible to 2 out of 4 of the tests. I don’t recall if it’s Broadcom (more likely) or Qualcom chips that are part of the issue. As the Naval research guys said, there needs to be an IEEE standard that all manufacturers adhere to so that all mobile devices handle randomization properly. Until then, turn WiFI off when not connected if you value your privacy. google actually announced parterships with stores for tracking users – even “aiding them to the location of a product” a short while ago. They really make me sick, along with FaceF*ck for abusing their users. Apple did this so you connect back to WiFi faster instead of having to search again for your network over and over. This idiot writer took like 10 pages to write a simple answer. Probably voted for Hillary. Not just security, it’s a major battery drain as well and decieving to the users. If will turn on both Wifi and Bluetooth automatically when I decide to switch out of Airplane mode, even if I chose to disable them before. This is another step in the wrong dirrection from Apple, I am dissapointed. So, why didn’t apple make it that when you simply want it off to save battery life etc, you hold the toggle or double tap? surely not rocket sience and well needed as it is doing my head in to go to the settings menu all the time. Can’t wait for the new samsung (s9?) and get rid of this growingly stupid and outdated ios. I totally agree that complete disable could have been implemented using a double tap, long tap, or force tap. Functionalities should increase in number, not the contrary. As probably most of you already know, turning WiFi off in settings is only temporary as well. Next day Apple will turn it back on for you – just in case you might have forgotten. Interesting nonsense opinion above about the geniuses Apple employs as engineers. Anyone who has a modicum of ambition, self respect and intelligence would not be found dead working for any of the giant faceless corporations. sometime I wonder if engineers at Apple actually use iphones.. Thanks so much; having customers auto-connecting when we’ve re-instated roaming charges after the UK leaves the EU will make us stacks of cash. Thank you! now we have to turn it off from settings because it will start again if we disable it from control center. Quite irritating though. Sometime the wifi even stops working after this latest update.